This is a site dedicated to the greatest game of all time: Half-Life 2. However, if you have any questions on the original Half-Life, feel free to ask. This site is created and maintained by one of the biggest Half-Life fans of all time. We have everything: pictures, music, wallpapers, and a walkthrough. We also have info on Counter-Strike: Source! The site has been totally revamped, redone, and re-released. Many parts are still under construction, however. Half-Life wins the Title Fight!!!!! Half-Life 2 stuck it out in the long haul to take home the gold in the big Title Fight. It has been declared the greatest game of all time by the site, according to the votes that many players have put in! 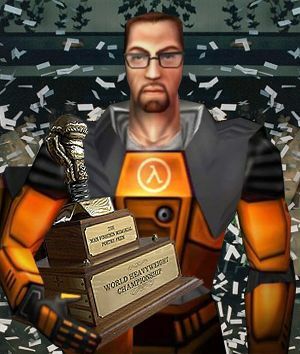 Congrats, Valve! You've made the best game ever! Of course, Gordon deserves it more than any other game. All content (unless specified otherwise) is copyrighted by law by the Valve and Vivende Universal Corporations.